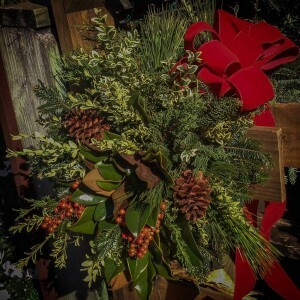 I know the holiday season is here when the greenery bunches, garlands and wreaths we’ve ordered begin to appear – not to mention fragrant Fraser fir Christmas trees. 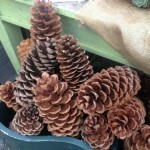 I was looking forward to two of the boxes in particular this year – the ones the huge sugar pine cones were packed in, just 30 to a box because they’re so big. Take a look in any craft magazine or on Pinterest and you’ll find plenty of decorating being done with these Northwest beauties! There hasn’t been much time for us to play with these big pinecones, but I was able to add a bit of ribbon and some greenery to a couple before it got too busy. A beautiful collection of these impressive cones in a large basket, with a bit of reindeer moss tucked between and curls of ribbon for more color, would be festive too. First the Christmas trees, outdoor garlands, and wreaths arrive, bringing the scent of the Carolina mountains to Birmingham. 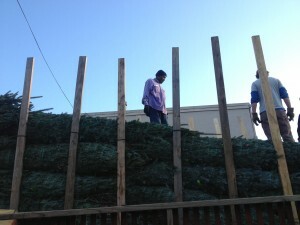 The trees are the stars of the show for a couple of weeks, and the buzz of tree drills and saws fill the air. Families arrive to find their perfect tree among the 700 that are drilled for our tree stands and given a fresh cut before they’re moved out for sale. 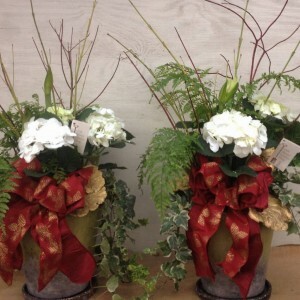 Bows for wreaths and other outdoor decorations are debated and chosen, and mailbox decorations are ordered. Slowly but surely the outdoor decisions are made, trees are delivered, and festive decorations for inside and outdoors are complete. Now the emphasis shifts to the greenhouse, a magical place during Christmas, full of pretty flowering plants and more, and we begin the party season. Containers fill the back design area, waiting to be transformed into beautiful arrangements ready on just the right date. Finally, closest to Christmas, teacher’s gifts and gifts for family are arranged, to be picked up just before the end of school or prior to leaving town. In fact, this year we had to make more room for finished pieces in front of the design area. Our new area has worked out well, since now it’s easier for everyone to see many of the finished centerpieces, pots, and special orders, and it gives people ideas for their own gifts or containers. There’s another new addition this year too. 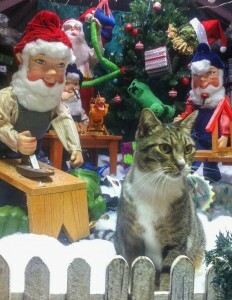 Tacca, our garden shop cat, is experiencing her first holiday season and is she enjoying it! She’s taken to sitting in our Christmas display, right in the line of sight of all the children, who come in to pet her while they look at Santa and his elves. 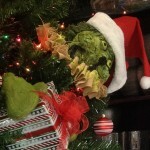 This year Molly created our wonderful grinch too. While Fraser fir scents fill the outside nursery, the greenhouse is truly a feast for the senses too, filled with colorful flowers and lights. 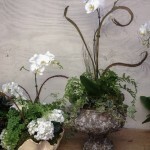 Here you’ll find orchids, amaryllis, jasmine, stephonotis, hydrangeas, rieger begonias and more, including the usual poinsettias. There’s really nothing like a true greenhouse, devoted almost entirely to plants of the season. Box stores with their fluorescent lights and a few holiday plants simply can’t compare. I hope you’ll come visit and see why. 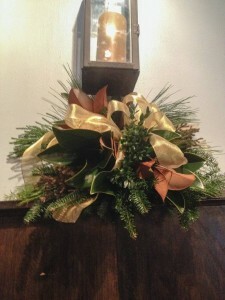 This entry was posted in Decorating, Holiday, Winter and tagged arrangements with amaryllis, christmas trees, decorating for christmas, flowers for christmas, fraser fir christmas trees, holiday decorating, holiday greenery, Hydrangea and amaryllis arrangement, stephanotis, sugar pine cones on December 6, 2014 by Kris Blevons. 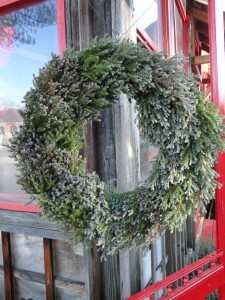 Christmas Trees, Wreaths, And Greens – Fragrant And Beautiful! 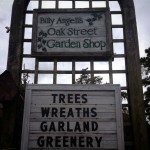 The day before Thanksgiving is the official start of the holiday season at Oak Street Garden Shop. Early in the morning the first of two flatbed semis arrive, bearing Fraser fir Christmas trees of all sizes, from the smallest tabletop trees for youngsters (and those young at heart!) to towering beauties for the grandest foyer. 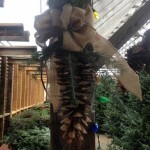 Christmas trees fill the nursery…. 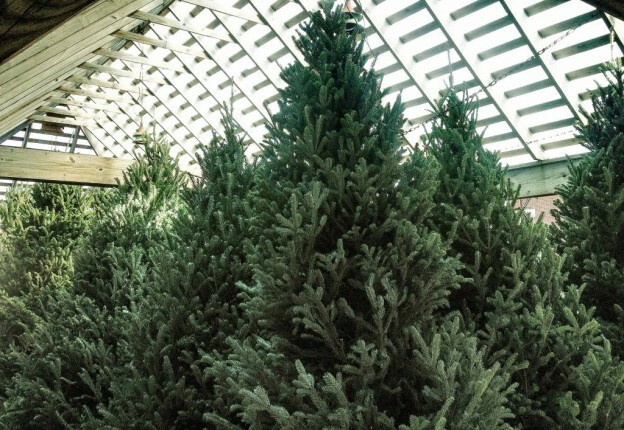 These trees (and the Fraser fir wreaths and garland that arrive from another favored supplier) come from the high elevations of the North Carolina mountains and make their way here to grace your homes through the holidays. 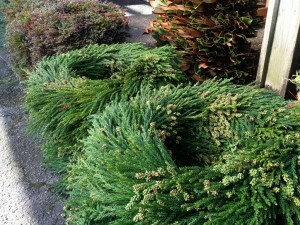 Other greens – mixed wreaths, berries and branches – come from Oregon, beautiful mixtures of evergreens not found in the South. 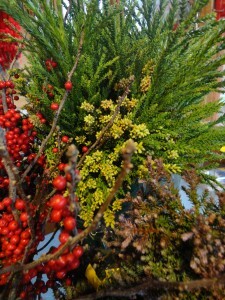 Still more come from right here in Alabama – our own homegrown evergreens – chamaecyparis, cedar and magnolia. 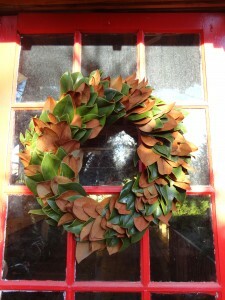 Truly there is an amazing abundance for your decorating needs! Mailbox decorations are made to order, each one designed with two pieces of caged oasis so the material stays as fresh as possible. 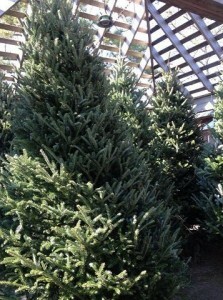 Using a base of Fraser fir (It smells so good! 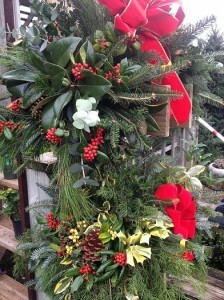 ), we add as many different greens as are available, inserting berries, pine cones, and a pretty bow to complete the decoration. Pictured here are two of them from last Christmas on display at the front of the shop. Or, if you’d rather make your own, we have the oasis available for you and ribbon galore! 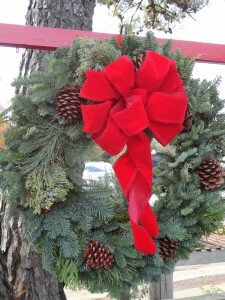 This entry was posted in Holiday, Winter and tagged chamaecyparis wreaths, christmas trees, decorating for christmas, fraser fir christmas trees, garland, holiday greenery, red star chamaecyparis wreaths, wreaths on November 25, 2013 by Kris Blevons.